A business essential outside of my direct service client work is membership and active involvement in NAPO and NAPO Chicago. This year, in additional to national conference, chapter meetings, neighborhood meetings, board meetings, referral and volunteer opportunities, and social events, I participated in a self-defense class with other NAPO Chicago members. Empowering! NAPO tags January as “Get Organized and Be Productive Month (GO) Month” which is always a source of inspiration for me! In January 2018, I organized a volunteer event for NAPO Chicago at the Northern Illinois Food Bank. We spend the morning sorting, inspecting, and organized food – enough to provide 1177 meals for our hungry neighbors in Northern Illinois. Also in the spirit of “Go Month,” I recorded a six episode podcast bundle, “Declutter Like a Pro!” The episodes break down the steps I use in a client’s space while organizing. It is like having a “professional-organizer-in-your-pocket” for guidance! The annual NAPO National Conference was held retreat-style at the Q Center in St. Charles, IL, which was super convenient! I attended the conference and volunteered on NAPO Chicago’s, “Host City Committee.” Because the conference was local, I was able to slip away to spend time with family because it was also my son’s junior prom that weekend! After conference, there was a suggestion for members of NAPO’s Golden Circle (a distinction for those who have been members for 5+ years) to create Mastermind Groups. The idea was to create virtual groups that meet once a month or so for advice, discussion, and input. When my first option fell through, I reached out to other Golden Circle members and started a group myself! We are six members strong, representing six states. It is a fantastic way to stay connected to the national conversation. On a sweltering summer day, while dropping off donations collected via Declare Order for a Heartland Alliance drive for children in their care, I struck up a conversation with a coordinator. This connection resulted in opportunities for NAPO Chicago chapter members to volunteer with Heartland’s holiday “Stuff-a-Stocking Campaign!” I always keep my eyes and ears open for opportunities to show how NAPO Cares! In November, I had the opportunity to serve on an education panel for NAPO Chicago members on the topic of “Chronic Disorganization” for our monthly chapter meeting. As Professional Development Director, I previously moderated and prepared the powerpoint presentation for these kinds of panels, so I appreciated being the guest for a change! One of my favorite things about 2018, was having the opportunity to present, “Declutter Like a Pro,” at several area libraries! The events at Bloomingdale and Bartlett Libraries were the most highly attended with focused attention and great questions from audience members. I also taught another adult education course at Waubonsee College – though the weather that Saturday morning in April did not cooperate! Brrr…! This past spring, creativity struck and I completed a general request from a compelling new magazine called, Anxy. The magazine had put a call out to readers to draw their definition of “boundaries.” Because my phone can be a distraction, I drew a busy bee turning off notifications in a beehive. To my delight, my original work was selected to appear in their newsletter. For those interested in mental health issues, I highly recommend checking joining their community. 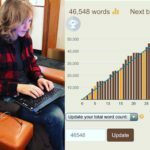 This November, I finally completed a NaNoWriMo (National November Write a Novel Month)! My book idea, a collection of client stories entitled, “Declaring Order: Life in the Middle of the Mess,” is now a 50,000 word pile awaiting editing and editing and, well, more editing. I owe my success to the eclectic group of writers based out of Naperville, IL, who provided camaraderie and chocolate at “write-ins” at local libraries. This year, I look forward to continuing to serve my clients, community, creativity, and NAPO. My goal this year to further adopt conscious consumerism into my work as I educate clients to change their acquiring habits, lower their stress, AND reduce their impact on the environment. January also hatches a two month INCubatoredu project that will find me volunteering with local 5th grade students in order to implement a small group entrepreneur curriculum during the school day. I am thrilled to have the opportunity to nurture the next generation of entrepreneurs! Thank you for reading! What are you looking forward to for 2019? Wishing you a happy and mentally healthy holiday and inspiration in the new year! Previous PostOrganizing Boundaries for a Child with Special Needs Next Postone. less. thing.